What could that possibly mean?!? We saw this sign while driving in the old hill top town in Cagnes-sur-Mer, France, last year. I still don't know what it means. The translation is simply "Red X". You can imagine the problem. You are driving around in another country and see an important looking sign. It must be important, why would it be there? But what does it mean? I took a picture and drove on. Fortunately I did not drive off the edge of anything or go the wrong way, well, at least as far as I know. It means that you cannot stop or park on this road. 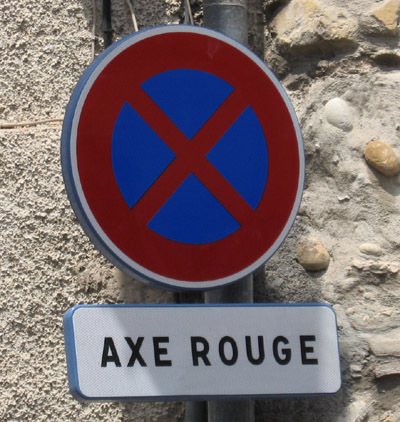 (because it could block all trafic) "Axe" is meaning basically "road", and "rouge" means "important" or with heavy trafic in this case.